As much as I love runDisney races, I haven't always been a fan of the character-based finisher medals. 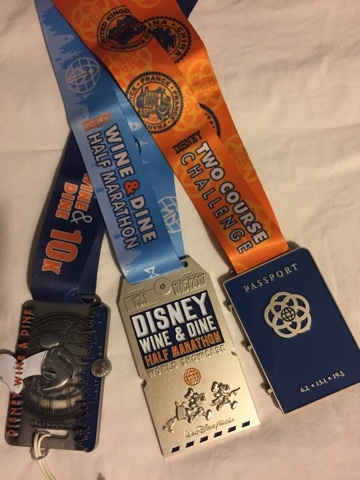 This year's runDisney Wine & Dine Half Marathon Weekend had a travel theme- and that travel theme carried over to the medals. The 10K medal was reminiscent of a luggage tag (complete with a leather tag "string"), the Half Marathon medal represented a plane ticket, and the Two-Course Challenge medal took the shape of a passport. The passport medal opens, to reveal stamps from all the countries around Epcot's World Showcase. I've heard some mixed reviews on these medals, but I love them. 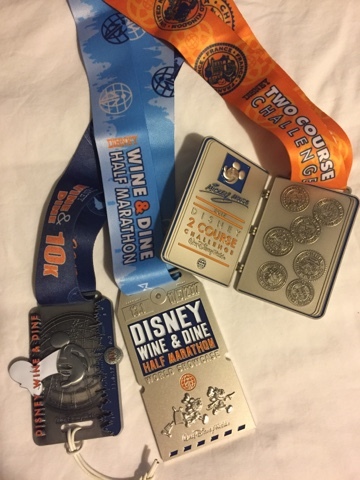 The Half Marathon and the Challenge medals are right up there with the now-retired Expedition Everest Challenge compass medals as my all-time favorites from runDisney. Did you earn any runDisney Wine and Dine Weekend medals? What do you think of the designs? Tell us about it in the comments. Thank you so much for sharing such brilliant information as always. I always do stop by here whenever i think like I need some information on particular topic in this niche and I do get the source for preparing my article for custom essay writing service That’s the main reason why i love the information shared over here. Do share more and more information as always.